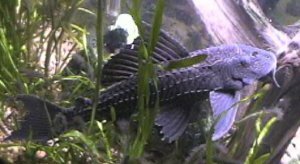 This page is specifically about the common plecostomus species but much of the information also applies to other species of plecostomus. The main differences between species are size, color, and plant-eating tendency. I have been told that I have the species Liposarcus pardalis . I used to think I had a Hypostomus until someone saw the following photo and told me I had Liposarcus multiradiatus . Then, in October of 2001, someone said I have Liposarcus pardalis and an expert agreed. No matter which exact species that I have, most of the large, brown-mottled plecostomus have similar care requirements so the following information is helpful for all of them. This is my common plecostomus, Liposarcus pardalis , taken 2/8/02 (at about 12.75 inches long). His name is Plecy. I bought him on 1/28/95. There are more photos and videos on the pleco photo page including a nice photo the same day of his underside. There are now five main common pleco pages. For information on algae-eating animals, check out the algae-eating animals comparison table which includes some information on other species of plecostomus as well as lots of other animals. Check out my bristlenose plecostomus and Queen Arabesque pleco pages too! I bought Plecy on 1/28/95 when he was about an inch long. In 1997, he was about 9 inches long. By 2/15/02, he was 12.75 inches long. By 12/18/03, he was 14 inches long. By January 2007, he was about 15 inches long. By December 2008, he is still between 15 and 16 inches long and more than 14 years old. I think I got a good measurement on him on 10/21/10 but only got 14 inches so either he shrunk or my measurements before were overzealous. I finally got a pretty good measurement of Plecy on 2/6/16 and got 15 inches. So, Plecy has not grown in the last nine years! He started out 1/28/95 in my 50 gallon tank with some goldfish. After he sucked on some of those goldfish after a year or two, he was banished to a tiny 10 gallon tank. I think that was in 1996 or 1997. He was cramped in there but still only a few inches long at the time. Then, he went in to a 40 gallon tank on 11/25/98 with a lot of pond-raised zebra danios and white cloud mountain minnows. In that tank, he had a growth spurt. On 3/31/07, he went in to his current 65 gallon tank. He lives with three male fantail goldfish. For details about the tank changeover, see the tank redo page. I discovered when cleaning out the old 40 gallon tank that Plecy had eaten almost all the silicon out of the tank except for the actual corners where he could not reach. I am really surprised the tank did not leak! I put some new silicon in there before setting up that old tank for my turtle. I sure hope Plecy does not eat the silicon out of the new 65 gallon tank! Photos of Plecy can be seen on the pleco photo page. My father told me that some loud noises were coming from my 40 gallon tank on 10/3/02 around 9:20 pm. I figured it was Plecy, my 13 inch (at the time) plecostomus ( Liposarcus pardalis ) who knocks things around. When I looked in, I could not believe what I saw. It appeared as if Plecy was trying to eat my huge 3" albino mystery snail ( Pomacea canaliculata , an apple snail). Then, it became apparent that, in fact, the snail had shut his trap door over Plecy's lip, and they were stuck together. Plecy was having trouble getting enough water through his gills and was thrashing around, slamming the snail hard into the glass. Since you do not just pick up a pleco covered in spikes, I put on my pond gloves and tried to catch/hold Plecy but that was futile as he was much stronger than I! Instead, I grabbed the snail, and then, Plecy was able to thrash free of the snail. Plecy was fine. I was worried that the snail might have cracked his trap door or shell but he was around cruising a half hour later. It was a battle of the nocturnal giants, like Godzilla and Rodan or something! If I had not been able to intervene, the snail would have been smashed by Plecy, and Plecy probably would have suffocated.